There are those who lead secretly. Fate places them at the right places, at the right times. They do what they have to do. Quietly. And then they die. Inevitably they disappear into those mysterious and dark folds of world history. It might be said that the Hamilton family of Niagara Falls was one of the most remarkable families ever to call this city their home. As research uncovers their stories—which have been buried deep in Oakwood Cemetery for over 100 years--their actions reveal a family that fought for the freedom of mankind. And some of their family members may surprise you. This little sketch from August 5, 1856, said so much but also left so many questions. Who were these wonderful people? Were they soldiers on the frontlines during the time of the Underground Railroad? It seemed like, perhaps, this was only the tip of the iceberg--for here was a special event honored with a front page write-up in the Niagara Falls Gazette. But most importantly, there were names: Gen. Gaines, John Morrison and L.H.F. Hamilton. We followed the trail left by all of these men until we found their fascinating histories. General Gaines may have been George Gains/Goins, a runaway who put on a concert in Lockport in order to raise money to buy his family members’ freedom. The mysterious John Morrison, head waiter at the Cataract House, ferried fugitives across the river. The story of L. H. F. Hamilton and his wife, Clarissa Condol, leads straight to the heart of Niagara’s experience with the Underground Railroad. It also takes us through the front doors of Thomas Jefferson’s home, Monticello. For a little background information….it might be necessary to understand that Niagara Falls was the last stop on the Underground Railroad. Up until now not much has been known about the people who led this movement in Niagara Falls. The great penalties brought on by the Fugitive Slave Act of 1850 made the movement extremely dangerous. There were huge fines levied on those who were caught aiding and assisting fugitive slaves and serious prison sentences. In order to ensure success, Niagara’s stop had to be carefully organized and monitored. Only the best could be had at Niagara. This was the end of the line. Most researchers are in agreement that the root of the movement was centered within the hotels. Specifically, the Cataract House. Assuredly, the managers were in on it-- but the muscle and the drive behind the fight was borne among the African American workers. There are numerous other accounts of “abductions” taking place at the Cataract House. The waiters were well known to frequently remove slaves from their traveling groups and secret them over the Niagara and to freedom in Canada. The 1850 Census of Niagara Falls, New York, provides the names of many of these brave warriors. There were men and women. You can tell who they are by the notations describing the color of their skin (black or mulatto), by their places of birth (southern slave states) and by their occupation (waiter). Many were runaway slaves. Many had family that had escaped to Canada and lived just across the border in Ontario. Of course, we don’t know everything about L.H. F. (Louis Henry Fetigue) Hamilton and his wife, Clarissa Condol. We do know that they were both “waiters” at the Cataract House back in 1850. A mulatto, born around 1823, in Washington, D.C, L.H.F. was probably the child of Catherine Bell—an enslaved woman. Clarissa, born around 1821 in Lyme, Connecticut, was the daughter of William Condol and Chloe Webster. She was part Native American and her father, William, was documented for his work on the Underground Railroad. In fact, the Condol family consisted of avid abolitionists, even some acting as subscription agents for Frederick Douglass newspapers. It is believed that L.H.F. and Clarissa were married in Geneva, New York. 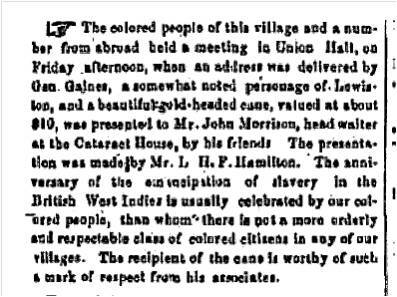 While in Niagara Falls, aside from presenting a beautiful gold headed cane to John Morrison, during a celebration of the emancipation of slavery in the West Indies, L.H.F. and his wife operated numerous businesses including a tailor shop, a dining hall, a catering business and most interestingly, “Hamilton’s General Agency and Intelligence Office” during the 1850’s. 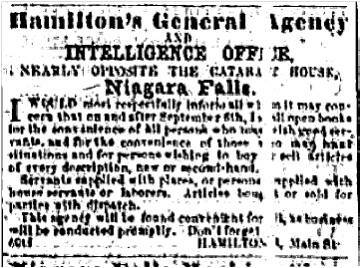 “Hamilton’s General Agency and Intelligence Office” was opposite the Cataract House. During this time period, the Underground Railroad was in full swing in Niagara. It is only conjecture at this point, but this sort of operation may have provided the perfect front for operating in the runaway slave business. It’s location opposite the Cataract House and the fact that it was the sort of place that African Americans would naturally approach if they were in need of “situations” made it seem possible that it could have been a spot for runaways to seek assistance. 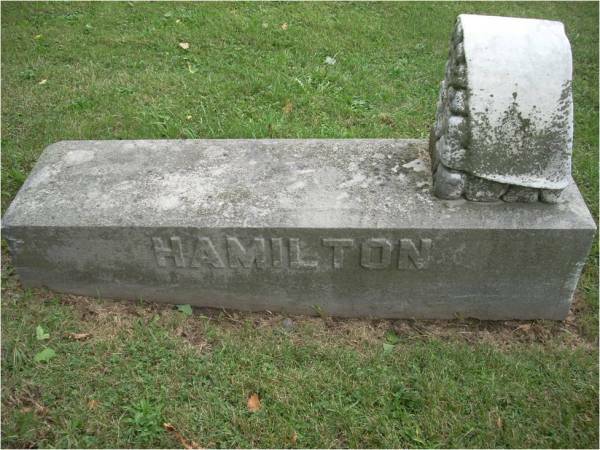 Throughout the years, the Hamilton’s were well known and respected members of the community. They had several children including: Catherine, Lewis and Henry. Henry was a photographer and news dealer. He operated “Hamilton’s Photographic Portraits” on Main Street in the later 1880’s. One of the most fascinating family connections came through Mrs. Hamilton’s sister, Dorothy Condol. Dorothy Condol was married (also in Geneva) to William Bell Fossett. By 1860 the Fossett’s were in Niagara Falls—and William, like L.H.F., was a waiter (according to the census). There may be other family connections between William Bell Fossett and L.H.F. Hamilton as Hamilton’s mother’s surname was “Bell” and Fossett’s middle name was also “Bell.” Another similarity involves the fact that they both resided in Washington, D.C., in their early years. Connections have not been substantiated at this point in time. There are just a few more interesting facts concerning William, though. Especially concerning his background. First of all, William Fossett may have been the grandson of Thomas Jefferson. Born at Monticello in 1821, he was the son of Joseph Fossett and Edith Hern. Joseph was the son of Mary Hemings (Sally Hemings’ sister) and perhaps Thomas Jefferson or a white carpenter named William Fossett (however no proof of his existence has been made). They were the slaves of Thomas Jefferson. When Thomas Jefferson became president, he removed to the White House and took William’s mother away from her husband in order to learn French cooking. Joseph escaped from Monticello at one point and ended up at the White House in order to be with his children who were deathly ill. He was severely punished for running away. Joseph was eventually made free by a codicil of the will of Thomas Jefferson in 1827 and so were most of the children. All of the other slaves belonging to Jefferson were sold to pay off his exorbitant debts. It is generally believed that those slaves set free in Jefferson’s will were of his own blood. It is also believed, by historians from Monticello, that Underground Railroad activity may have led William Fossett to Niagara Falls. Fossett was in Niagara Falls as early as 1854. He may have been a waiter at the Cataract House. It was said that he had worked as a caterer with his brother until he had been “given charge of a hotel at Niagara Falls.” Of course, their cooking skills were most likely gleaned from their mother, who had brought French cooking to America through Thomas Jefferson. Both William and his brother, Peter, were extremely active in the Underground Railroad—mainly in Cincinnati—after the period in Niagara Falls. It is possible that “many a time” the brothers may have hidden a fugitive in some secret location until they could be taken on to Levi Coffin or to John Van Zandt’s station. Detailed records do not exist to tell of their time in Niagara, but it is possible (and probable) that William and his wife, Dorothy, may have been quite active in the Underground Railroad here in Niagara Falls, alongside, the Hamiltons. In the end, L.H.F. and Clarissa took much of the story of their role in the Underground Railroad to their graves. L. H. F. died on May 14, 1903. He was 79 years old. Clarissa died on January 6, 1915. She was 90 years old. They rest not too far from some other active participants in the Underground Railroad…but their stories will be for another day.